There are elaborate court scenes in Paavada that test our patience for two and a half hours, writes Paresh C Palicha. Alcoholism has become so endemic in Kerala that you see serpentine queues in front of the state run liquor shops from daybreak as people do not need an occasion to drink in Kerala. People of Kerala celebrate every holiday, every Hartal by drinking, and you see this reflected in Malayalam films too. In almost all Malayalam films, you see people drinking and making merry all the time. Paavada starring Prithviraj also have a similar theme where Prithviraj plays ‘Pambu’ Joy (Pambu or snake is a nickname used for drunkards as they creep on the floor like reptiles once they are drunk). Directed by G. Marthandan, Paavada tells the story of two alcoholics ‘Pambu’ Joy and Paavada (long skirt) Babu (Anoop Menon). Joy is a skilled youngster knowing every job from cooking, plumbing to tapping rubber. But his life is ruined because of drinking. On the other hand, Babu is an ageing man who likes to recite dialogues from the plays of Shakespeare. He is a rich man who used to be a professor of English. Joy is married to Simi (Miya), a nurse but she left him and works in an old age home. That prompts him to go into a de-addiction clinic. Babu is also forced to join the same clinic run by tyrant of a priest played by Chemban Vinod Jose. Here they become roommates and form camaraderie, then one fine night, they run away. They continue to live in their jolly ways until the very end of the first half when Joy discovers that Babu was instrumental in doing something that had wreaked havoc in his life. Babu had produced a sleazy film Paavada in which Joy’s mother Sicily (Asha Sharath), an accomplished theatre actress was deceivingly made the leading lady. Then we go into a flashback about how Babu who had set out to produce an artistic film with the potential of winning awards, made an ‘Adult’ film. Things do not stop here. The main culprit Eldo (Kalabhavan Shajon), who was the production controller of the film and who had made the changes to make it saleable, announces that he is going to re-release Paavada in 3D format. The screenplay by Bipin Chandran goes on to discuss the ethical, moral and legal issues pertaining to such situations. There are elaborate court scenes that test our patience for two and a half hours. The second half is also congested by a few notable cameos by the likes of Murali Gopy (as the art director), Sai Kumar (as Babu’s father) and a very special appearance by Manju Warrier. 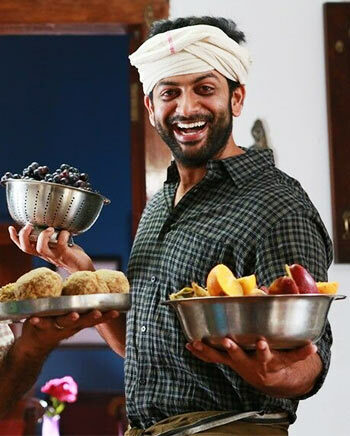 This is one of the fertile periods in Prithviraj’s career and he makes it even better with this film. He has to be a breezily comic fellow in the first half that he does unpretentiously making this film yet another winner as far as his performance goes. He gets able support from Anoop Menon, Nedumudi Venu and Maniyanpilla Raju (who is also the producer of this film). Paavada can be called a decent effort only if we ignore the flaws.